I’ve mentioned before that I participated in Joslin’s Why WAIT? program. It was accomplished through a combination of increased exercise, decreased food intake, and the addition of Symlin to my D-regimen. 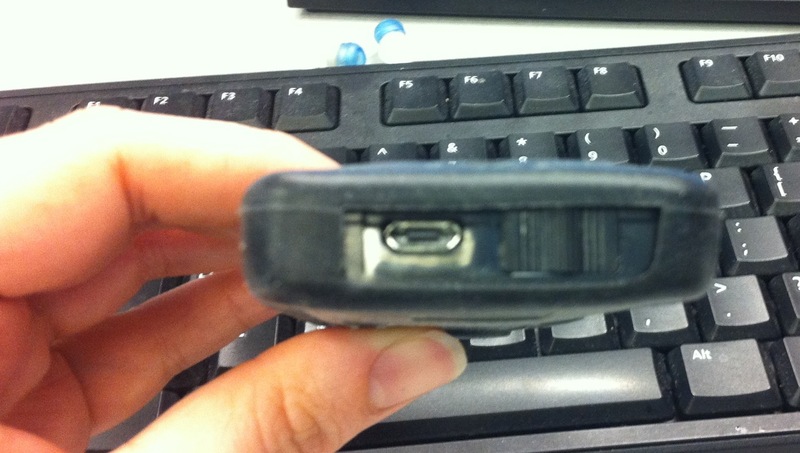 These things combined to cut my total daily dose of insulin in half, and then some. Originally the team had wanted to switch me from Humalog to Apidra because it peaks faster and would theoretically have made blousing with Symlin a bit easier. But, I had 10 vials of Humalog in my fridge, no real job, and switching just wasn’t an option. Fast forward to last month, about 4 or 5 months post Why WAIT?, to my endo appointment. I approached my endo about switching to Apidra since my humalog supply had dwindled, and, although she wasn’t sure the benefit would be significant, she didn’t see any reason not to try it. So, I walked away with a prescription for a three months supply of Apidra. After some trouble getting things straightened out with my new online pharmacy, I finally received the Apidra two weeks ago and began using it last week, on Feb 28 at 7pm. And then it began. Day 1: Hello Apidra. My BG is running high all day; I wake up with a BG of 120, eat nothing and by the time I’m at work an hour later my BG has jumped to over 250. I do correction bolus after correction bolus to no avail and spend the entire work day over 250, even after eating a carb-free salad for lunch. Promptly at 5pm, when I normally head home from work, all of the boluses finally catch up to me and I drop almost instantly to about 55. I correct and make it home with a BG hovering around 100. Dinner is chicken and brown rice. My BG stays flat until bedtime but as soon as I fell asleep, Dex begins to wail. I probably test and correct 5 times overnight and my BG stays flat around 200 all night until an hour or so before dawn when it levels off around 100. Day 2: Site change in AM. Repeat of day one. Day 3: After the last 2 days of BG hell , I increase all rates and ratios by about 10% (except the post work/before bed ones) and shorten the IOB time on my pump so I can bolus more aggressively. I also add Symlin to most meals. My BGs level off a bit but they still sit well above my happy zone all day and require frequent corrections that seem to have no effect. I go low overnight. Day 4: It is like Day 3 never happened and is a repeat of Day 1, again. (Only I have a low-carb, high fiber dinner that send my BG up to over 400!) In the middle of the night I have a low that requires 3 juice boxes and I still wake up the next day with a BG of only 75. Day 5: Increase all rates again. No change. At this point I realized that I should be monitoring for ketones and luckily find none. Day 7: After talking with the nurse educator and experiencing my 8th BG over 400 in less than a week (which is a number I haven’t hit in years! ), we decide that I will switch back to Humalog immediately after work today. Good bye Apidra. You will not be missed. So, unless this was some sort of ill-timed, un-related BG surge (which I doubt), everything should be straightened out soon. And I can’t wait. However, I now have 5 bottles of Apidra that I don’t know what to do with. does anyone know of a place to “sell” (It would be great to get some part of the $60 copay back) or donate unopened bottle of insulin? 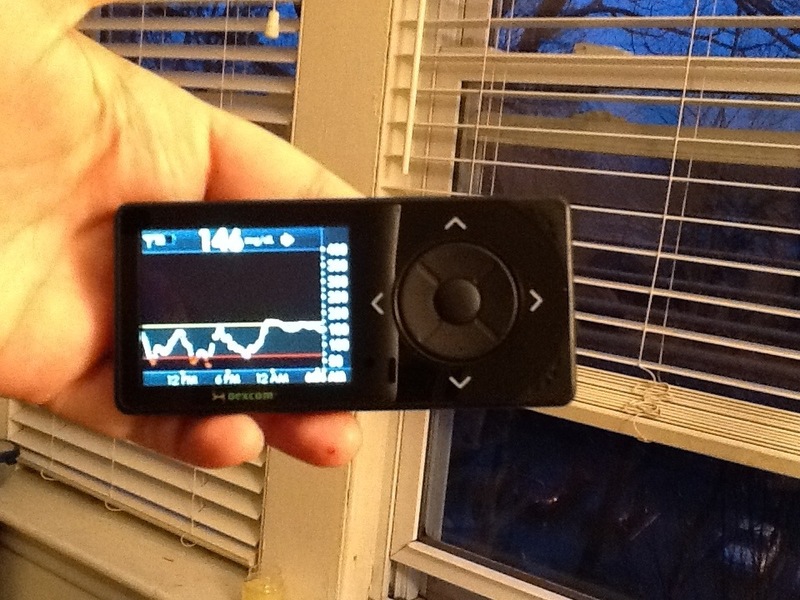 I spent 52 hours last weekend hooked up to a machine that completely took over control of my diabetes care. The weekend was certainly not without its ups and downs but in the end I am happy to have been a part of the study. First a little background information. 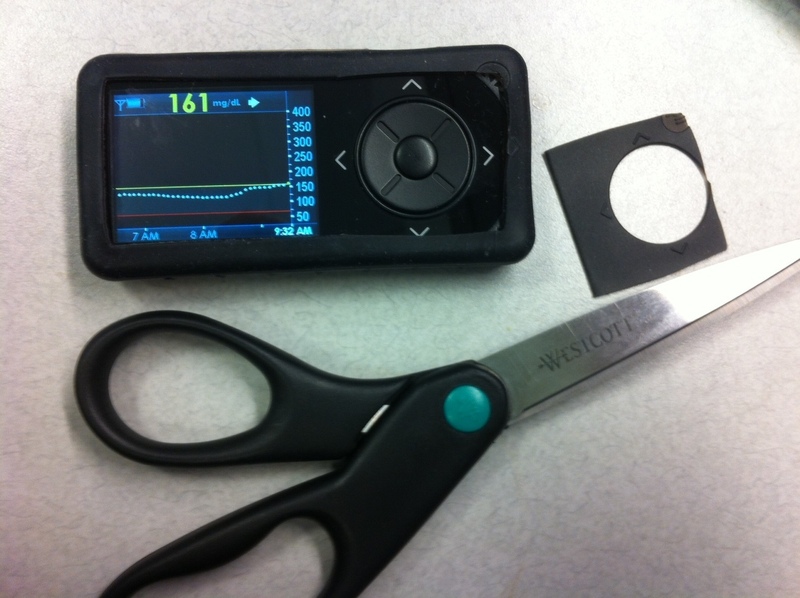 This study, known as Integration of Continuous Glucose Monitoring Into a Bi-Hormonal Closed-Loop Artificial Pancreas for Automated Management Of Type 1 Diabetes (CL2) has two principle investigators; Steve, who oversees the clinical trial and all things medical, and Ed, who oversees all of the pharmico kinetic (no idea if I spelld that right!) and engineering issues. (Funny side note: When Googling “Steven Russel” for that hyperlink, I came across this person who is definitely not the same Steven Russel as the one leading this study.) I only met Steve breifly so I don’t know much about him, but Ed developed his passion for diabetes care when his son, now 12, was dx’d at 6 mo. He is incredibly passionate about his work and was very forthcoming with information. Ed explained to me a little about the evolution of the project and how their first patients were pigs (diabetic pigs are cute) and after those trials were so successful they began clinical trials with human subjects. They have ran their experiment many times and with each trial they learn something new and then incorporate what they learned into the next iterations of the study. For example, many of you know Abby Bayer over at SUM, and may have read about her experiences with the same trial here (and here). Because of her, they told me that now they are keeping a closer eye on subjects’ nausea to see to what extent this really is an issue. They are also exploring to what extent the excessive food intake that they require may have played a role and if they should find some way to scale food intake to body mass or something. Before he left, he showed me that he could see my graphs on his iPhone in real time and told me that I shouldn’t worry because, as usual, he will keep a close eye on it for the duration of the experiment. 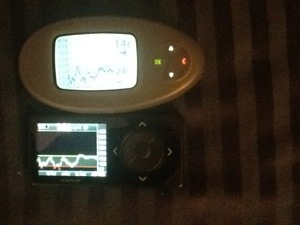 So, I was hooked up to two OmniPods, one with insulin and the other glucagon; 4 CGMs, a Dexcom, a new Guardian (next generation, not yet on the market), and two Navigators, one active and one back up; and an IV that fed my blood to a Glucoscout which provided an accurate BG level with which they could evaluate the various CGM data. 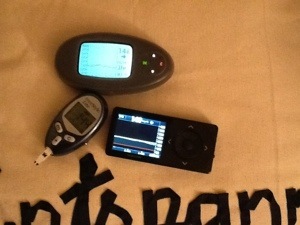 The active Navigator and the pods were connected to a laptop computer that had complete control of my insulin and glucagon dosing. All the software knows is my weight, the CGM data provided by the Navigator, and if I am about to consume a meal and it then doses either insulin or glucagon accordingly. It also learns from the past and adjusts all doses according to how your body reacted previously. I would easily rate their software a 4.5 out of 5. On day one, I ran sort of high. This was due mainly to the lack of previous data upon which the software could adjust my doses. For every meal on day two the software did a better job of keeping my BG in range. 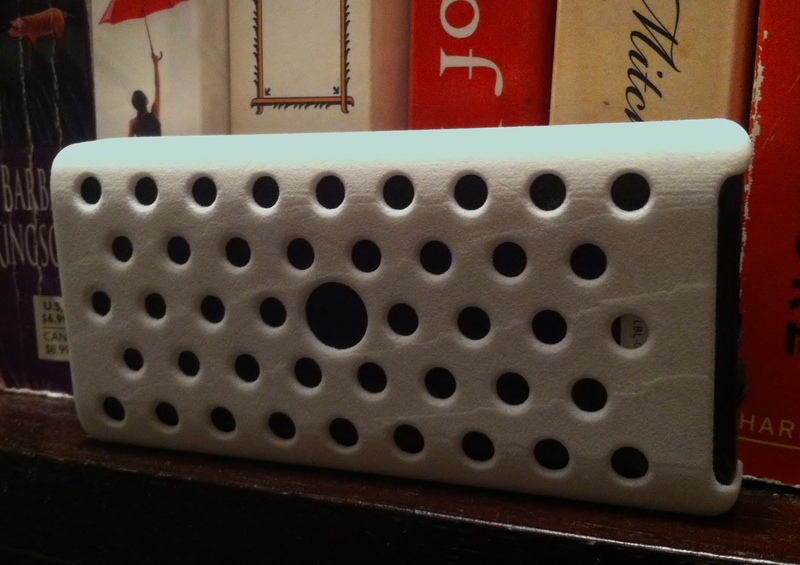 Unfortunately, overall, I’d probably only rate the entire system a 3 out of 5. The reason this number is so much lower than that I gave the software is because the difference between my blood glucose and the reading provided by the CGMs were just not close enough. 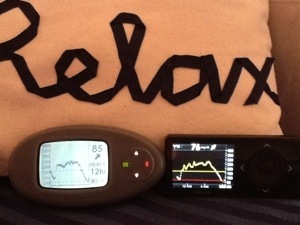 At one point, I received a dose of glucagon when my BG was 180 because the CGM told the machine I was 120. Another time (actually twice), the CGM stopped providing information at all to the software (which required numerous new Navigators to be applied) at which point the software seemed to resort to a standard basal rate which was too low the first time right after I ate a meal (which led to BG readings in the 300s and trace ketones) and too high in the middle of the night (resulting in juice drinking and almost an end to the study). Remember how I said that Ed told me that he would be watching my graphs all weekend? It was totally true – any time the Navigator went off line or the readings differed from the Glucoscout to the Navigator, the phones were ringing constantly because the entire research team was watching from home and wanted to know exactly what was going on. 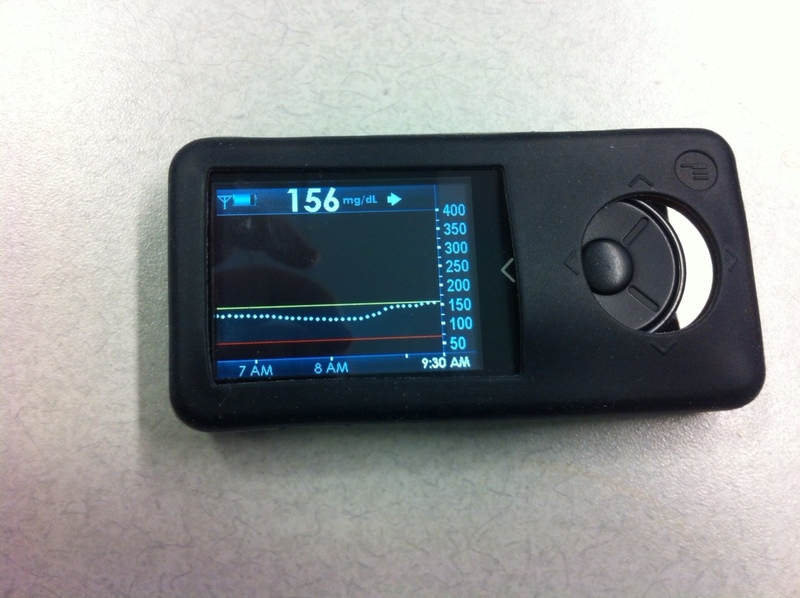 As much as that fantastical world without basal testing or carb counting sounds great, I wouldn’t leave my diabetes in the care of this machine with only the current CGM technology to power it. So, 52 hours, 4 IVs, 6 CGMs, 6 pods, and 480-720 grams of carbs later, I survived the clinical trial and am really no worse for the wear. 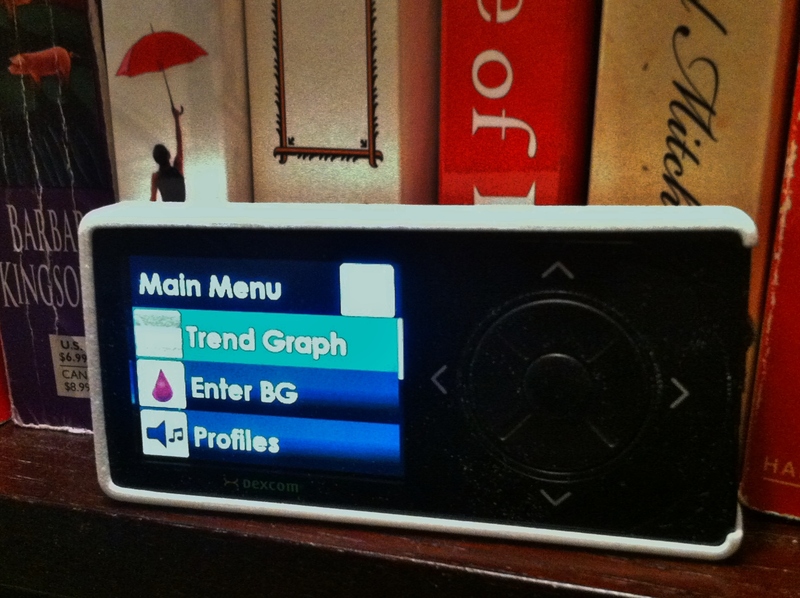 I got to experience a bit of what diabetes management might be like in the future and I like it!